While the NLCRT is dedicated to supporting Respiratory Therapists in their delivery of high quality, safe and ethical care to the public of Newfoundland & Labrador, it is not a teaching institution. The NLCRT is a professional, self-regulating body with the primary focus of serving and protecting the public interest. 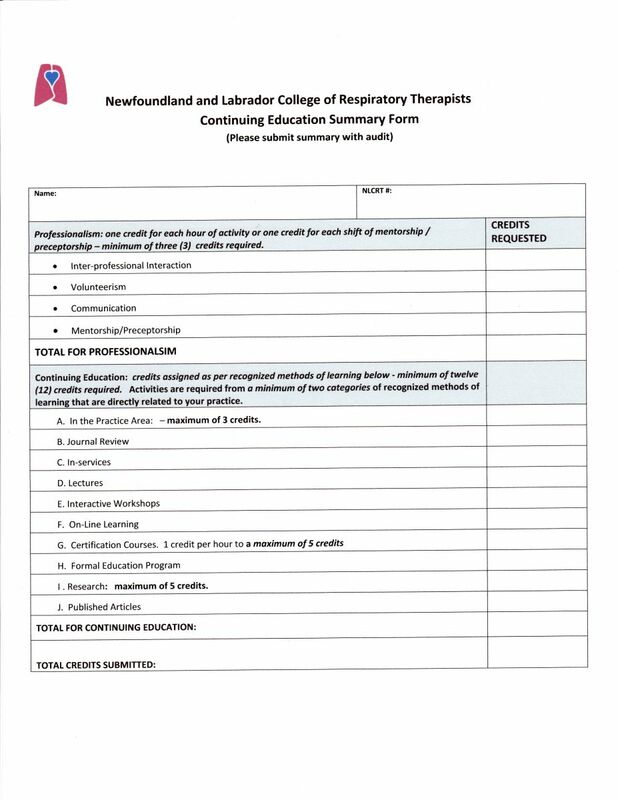 The following Continuing Competency Program outlines the requirements a Respiratory Therapist must meet to continue to practice in Newfoundland and Labrador. These requirements include participation in activities promoting professionalism and continuing education competency. The enclosed list of recognized methods of learning defines the various categories of learning activities and assigns point values to each activity and each category. The QA committee of the NLCHP will conduct annual audits of 25% of the membership. If selected for an audit, the member will receive notification from the NLCHP with directions on how to submit proof of all learning activities and verification of active practice hours in the past year. Submitted portfolios will be forwarded to an assessor for review. The Registrar/Assessor will contact the member if there are any questions or concerns about the submitted learning portfolio. Once the portfolio has been reviewed, the Registrar will notify the member. A deadline for submission will be set and failure to provide the requested documentation by the deadline may result in fines/suspension. 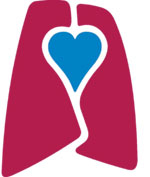 To ensure Respiratory Therapists in Newfoundland and Labrador have the capacity, competence, capability to safely and ethically practice Respiratory Therapy, the NLCRT ensures competence by adopting the National Competency Profile for Respiratory Therapists, requiring graduation from accredited educational facilities and successful completion of recognized entry to practice examinations (Canadian Board of Respiratory Care). The NLCRT aims to ensure members maintain their competency by requiring proof of active practice hours and compliance with a recognized Continuing Education program. Submitted credits should be related to the member’s field of Respiratory Therapy and, in some manner, should strengthen, enhance or improve an RT’s ability to provide competent, efficient and safe care to patients/clients/ residents. Inactive members of the NLCRT will be exempt from providing proof of Continuing Education activities. Members returning to active practice after a period of inactivity may be subject to knowledge and skills review before being allowed to hold an active license. This may not apply to members who have maintained an inactive license with the NLCRT but have continued the practice in another jurisdiction. Members off for part of a year may still be required to take part in CE audits. Members are required to accumulate a minimum of 15 continuing competency credits annually. Three (3) credits must be earned in the Professionalism category and the remaining 12 credits must be accumulated from a minimum of 2 different sections of recognized methods of learning in the Continuing Education category. The two categories, with assigned points, are outlined below. 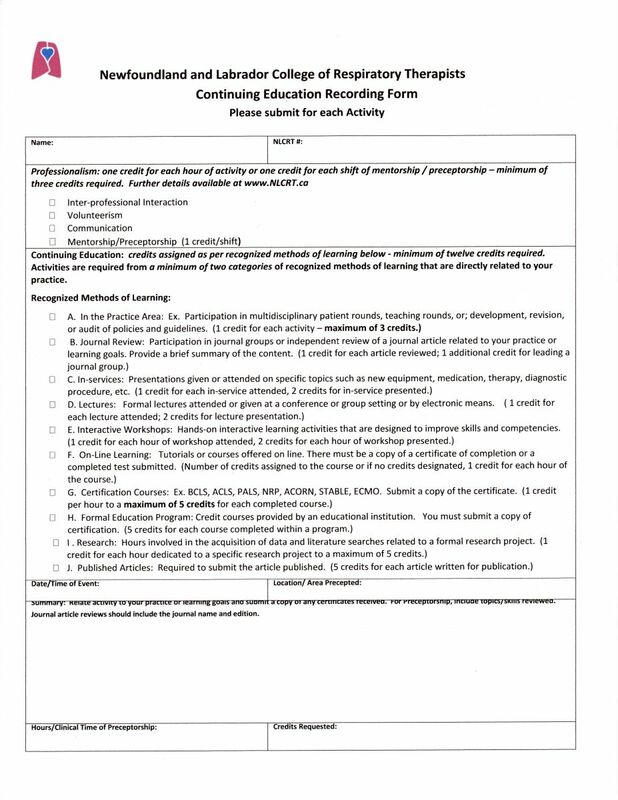 Each credit must be submitted on the Continuing Education Recording Form as developed by the NLCRT with appropriate details provided and supporting documents attached. Credits submitted must be related to the member’s area of work and in some way enhance their ability to provide safe and competent care. Continuing Education is activities that enhance your knowledge or skills in providing patient care. These credits should be related to your field of practice and strengthen your ability to provide efficient, competent care to patients/clients/residents. • Participation in multidisciplinary patient rounds, teaching rounds or attendance at multidisciplinary rounds with subject matter identified and related to the members’ practice. Documentation must include specific information such as dates, what was learned, and how it changes/enhances daily practice. • Participation in journal clubs or independent review of journal articles related to the members’ practice. Members will be required to note the name and edition of the journal along with a brief description of the article’s content and how it affects practice. C. In-services – 1 point for each in-service attended or 2 points for each in?service presented. • Presentations given or attended on specific topics such as equipment, medication, therapies, diagnostic procedures etc. In--?services may be in person, by teleconference, WebEx, tele-health etc. Subject matter must be identified and related to the members’ area of practice within Respiratory Therapy. D. Lectures – 1 point for each lecture attended or 2 points for each lecture given. • Formal lectures attended or given at a conference or group setting or by electronic means such as teleconference, webinar, tele-health etc. The subject matter must be identified and related to the members’ area of practice within Respiratory Therapy. E. Interactive Workshops – 1 point for each hour of workshop attended or 2 points for each hour of workshop given. · Hands on interactive learning activities that are designed to improve skills and competencies. Workshop subject matter must be identified and related to the members’ area of practice within Respiratory Therapy. F. On Line Learning – 1 point for each hour of the course or the number of continuing education credits assigned by the course. • Tutorials or courses offered on line with identified continuing education credits assigned. There must be copy of a certificate of completion or completed test submitted. The subject matter must be identified and related to the members’ area of practice within Respiratory Therapy. G. Certification Courses – 1 point per hour of the course to a maximum of 5 points for each completed course. • Recognized courses that provide certification in specific skills and competencies such as BCLS, ACLS, PALS, NRP, ACORN, STABLE. The subject matter must be related to the members’ area of practice. A copy of a completion certificate must be submitted. H. Formal Education Program – 5 points for each course completed within a formal education program. · Credit courses provided by an educational institution designed to further professional education. · Completion of programs that provide additional professional certification such as COPD Educator or Asthma Educator. The subject matter must be related to the members’ area of practice. A copy of a completion certificate is required. I. Research – 1 point for each hour dedicated to a specific research project to a maximum of 5 points. · Hours involved in the acquisition of data and literature searches related to a formal research project. An abstract of the research topic and findings will be required as well as the name of the senior researcher and title. · Hours involved in the development of a research proposal. A copy of the approved proposal must be submitted. J. Published Articles – 5 points for each article written for publication. · Submission of the published article is required. If the article is related to formal research, the associated research will be credited under the research heading above.